Hmm, yes. I think some humour would be required. 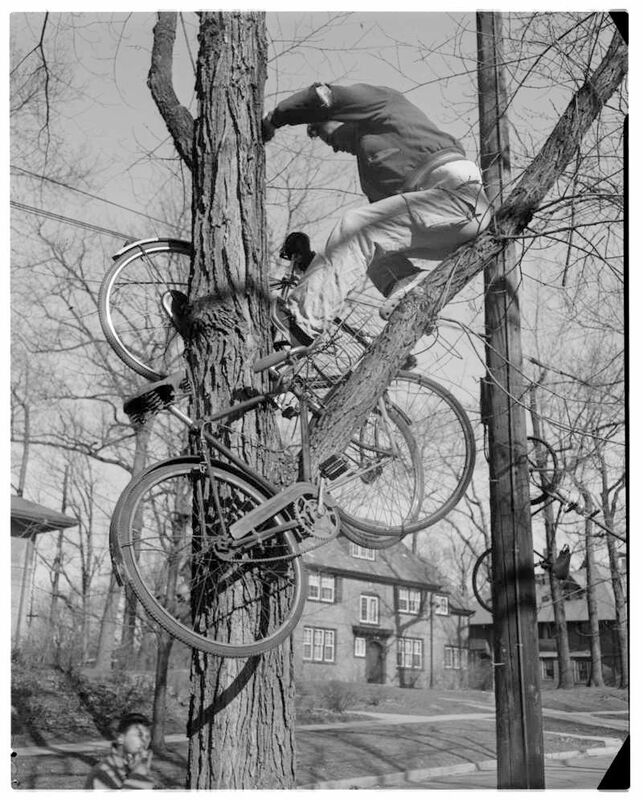 “Fraternity spokesmen said there was no special reason for the devilment.” I love the word “devilment,” and the idea that in some universe there could be a rational reason to put 25 bikes in a tree, and the fact that the fraternity has spokesmen to address this matter with the press. Wonderful. UM Greek Life hijinks has a long history, obviously. It’s fine as long as the devilment remains contained to their own frat house property and is cleaned up by the brothers, Beth. That’s my take and I’m sticking to it. Hilarious, and what a wonderful piece of “history” to unearth! I wish more of the news we read today was so light-hearted. that puts a whole new spin on bike in the tree. LOL love the humor Beth thanks for sharing!!!! If I saw a tree growing bicycles, I would think I had died and gone to heaven. The trees grew pedals as well as leaves. I too like the term ‘devilment’. “bike fling” just came out of my sleepy brain, Beth. 🙂 Loved your three smiles sent my way. Balancing acts: Tree climbing and bicycle riding. ah, takes me back…at some point a fraternity fellow invited me to visit him in ann arbor…it was nixed because I was only 14? maybe my folks were pretty smart after all? College kids are a bit crazy sometimes. Yes, I suppose so. We take our crazy with us into parenting, don’t we?